I love cartoons that can make me smile. And Marti can do just that! Haunting: The little girl did it. The body parts littered on the lawn: three heads of children with creepy crawlers going into their eyes. What a gory sight. I wondered who with the right mind could do such a thing. Macabre! No one was around and with my quick thinking, I pulled my camera to take pictures as evidence. As a witness to a crime scene, I must take notes and collect evidence to back up my story. Kneeling on the grass, I positioned myself as close as possible to the heads and tried not to touch the icky-yucky crawlers. Click, click, click. And more clicks, taking more shots as quickly as possible because I am just so excited with the situation. As I was about to get up, a mother and a little girl came around. I was surprised by their presence being caught in their lawn. I quickly got up on my two shaky legs and before I could say something, the little girl exclaimed, “I did that. Yup, I took them apart and put them there”. She said this proudly and her Mom just smiled at me. The next door neighbour is no better. 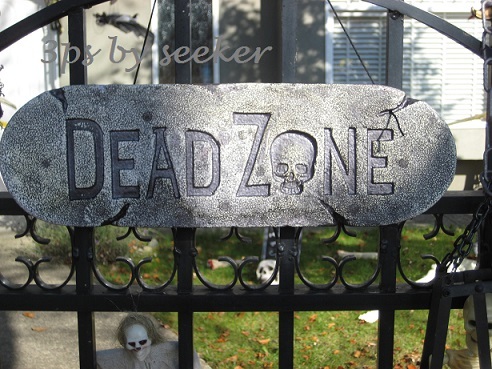 It’s a Dead Zone! The whole nine yards turned into cemetery. It appears that dead bodies were dug out from the grave. Skulls and skeletons, feet, legs, torso and an empty can of pop. The pop will surely have finger prints of the murder or murderers. As I was about to collect the pop can, the haunting chased me away. The ghosts of poor souls remained on earth and never rested. Rest In peace, my friends, rest in peace. I promise I will find who did this unspeakable acts and said a short prayer “Have mercy on these poor souls” as I took my leave. Oh, a cemetery! I exclaimed to my friend. Let’s go inside and look for ghost. From what I’ve heard, this is a haunted cemetery and there were ghosts sighting. On a hot day in the middle of the afternoon, it would be fair to assume that ghosts do not show up in broad daylight. It’s too hot for them to come out. Besides they are hard to detect when the sun is in full beam. My friend ignored me because she hates ghost after having a bad experience when the ghost went charging right into her face. I thought it was funny, but not for her. Instead, she told me that the this is the burial-place of Emily Carr; only if she can remember where it was. Off we went, inside the cemetery. 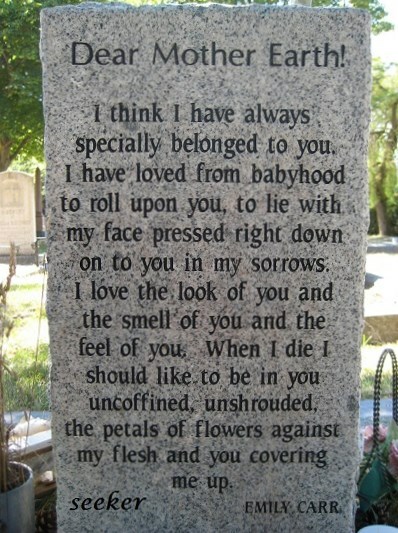 It’s a beautiful old cemetery. 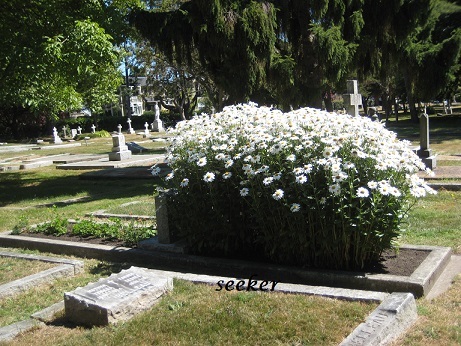 I found one that is adorned with flowers; real living white Shasta daisy garden. This is what I call pushing the daisies. And this is the oldest tomb in the cemetery. I wonder what kind of life this person had and what caused her demise. 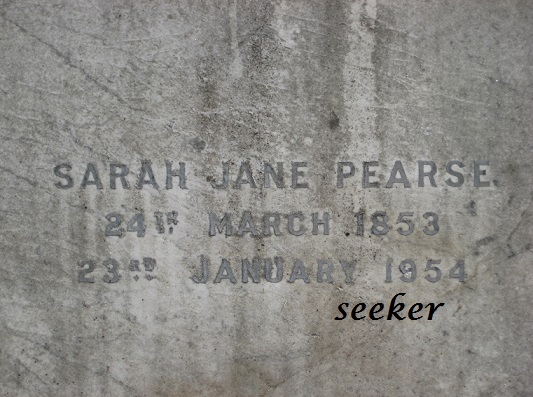 Inscribed is Sarah Jane Pearse on the stone; what a beautiful name. She lived over a hundred years old. 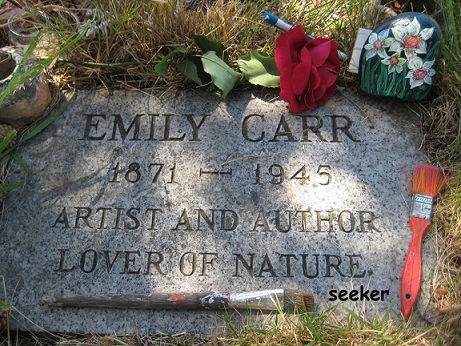 We went round and round in circles in the cemetery looking for Emily Carr. I can’t find the tomb, not even a single apparition. There was a group tour at the cemetery and I really would like to speak to a living soul who knows where the tomb of Emily is. But my friend is such a kill joy she wants me to keep quiet. Zip my lips. Finally, I am tired from walking and took a rest under the canopy of trees. In my mind, I spoke to Emily. “Emily, show me where you are buried. You hear me?” As soon as I said that, I saw a white butterfly coming towards me. What an interesting thing to see a butterfly when there is not even a peep from the birds due to the heat. Where did you come from butterfly? 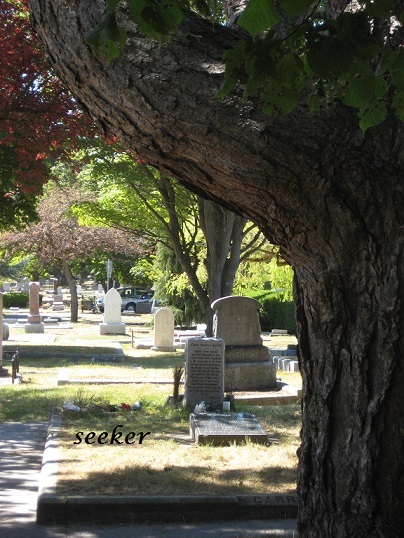 I walked towards where the butterfly came from and I saw two people standing by a tomb from the distance. Walking towards them without a sound, I could see that the tomb has a few things on it. Curiosity took a hold of me and I want to find out what it was. When the couple left, I went closer. Much to my surprise, it’s her. Emily Carr. Emily Carr, thank you for hearing my words and for sending a messenger to show me the way to you, a butterfly.